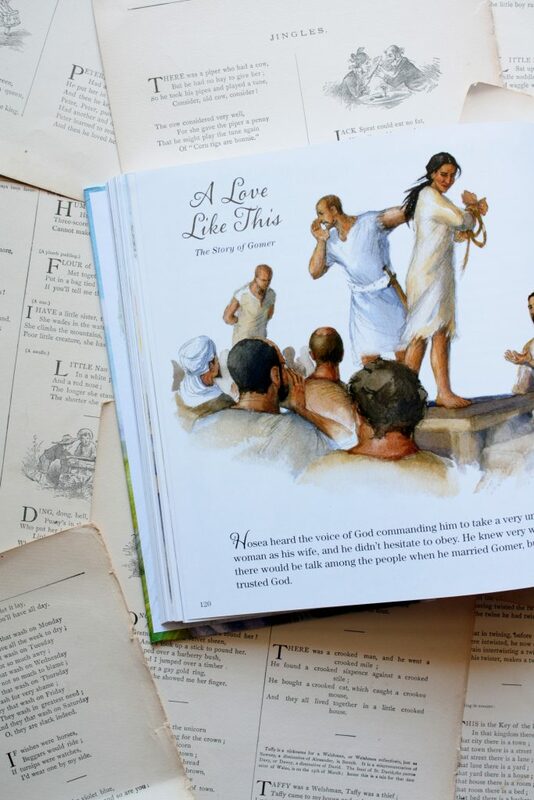 This full-length study Bible aimed toward adults may not seem like my usual fare. But I’d like to argue that, actually, it is. 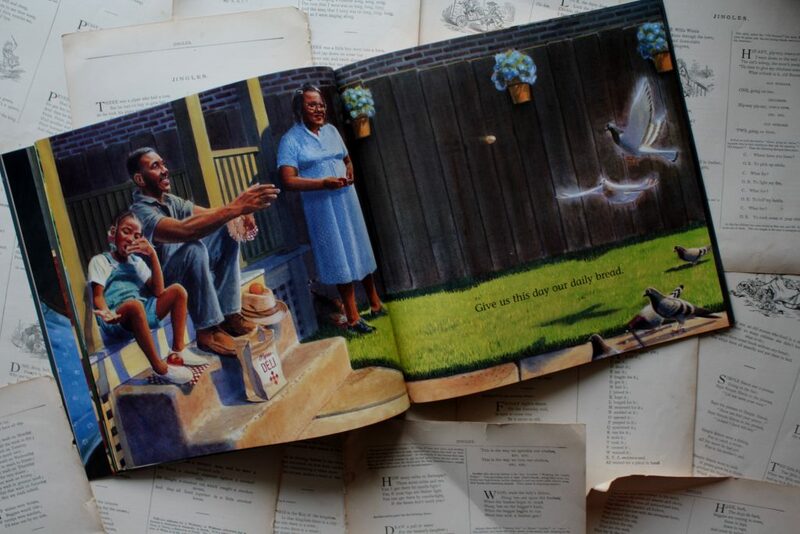 This is a children’s book (as well as a book for the mostly-grown, the fully-grown and the elderly), and it is certainly one that emphasizes the Big Story. What makes it seem like an unlikely subject for review, however, is the fact that I don’t really intend for you to read it to your kids. The older my children get, the more I realize that I can’t teach them anything I don’t know. And I can’t expect them to follow me in anything I don’t live. I can tell them, Yes, we must eat our salad. Here are three excellent reasons why salad is beneficial. But if they hear me say this and then watch me take the tiniest helping of salad and push it around on my own plate without taking a bite, they won’t be fooled. 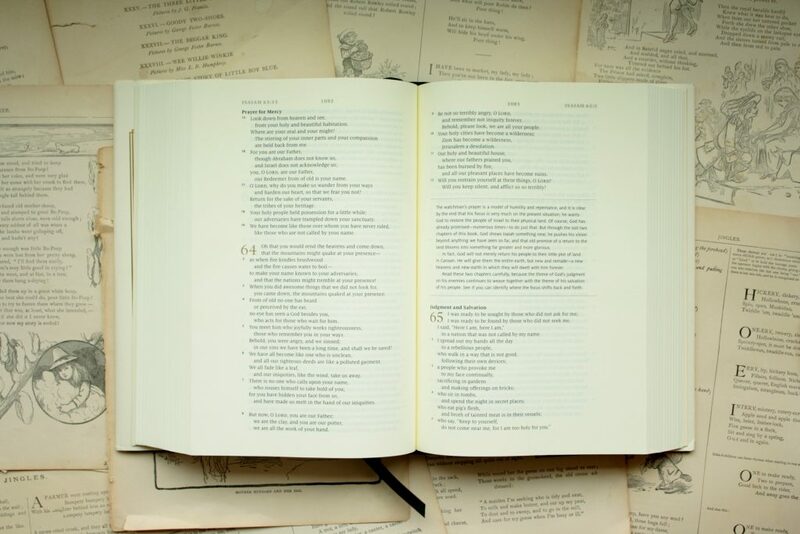 Likewise, if, in my attempts to encourage them to love Scripture, it becomes clear that everything I know about it comes second-hand from Marty Machowski (excellent though his work is), they won’t be fooled by that either. 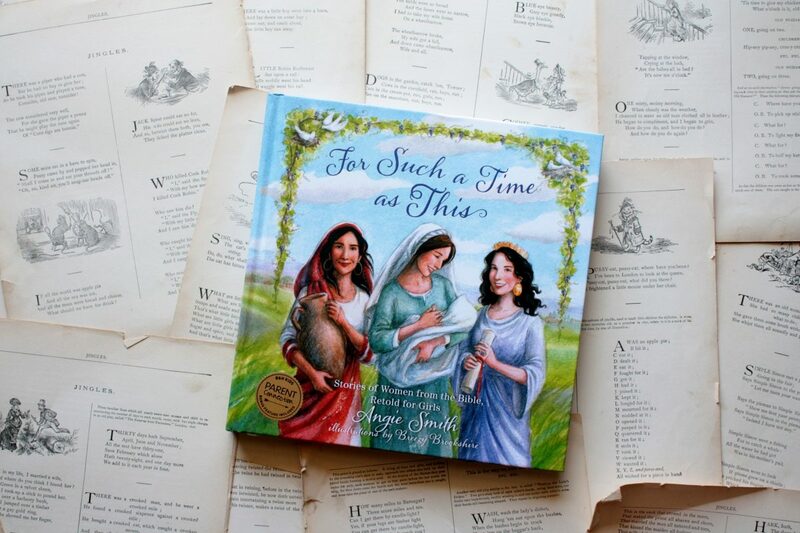 What I need, in those heated parenting moments, is not a flow chart from a parenting book or an applicable devotional (though those are both helpful), but a deep love for the gospel and its Author. 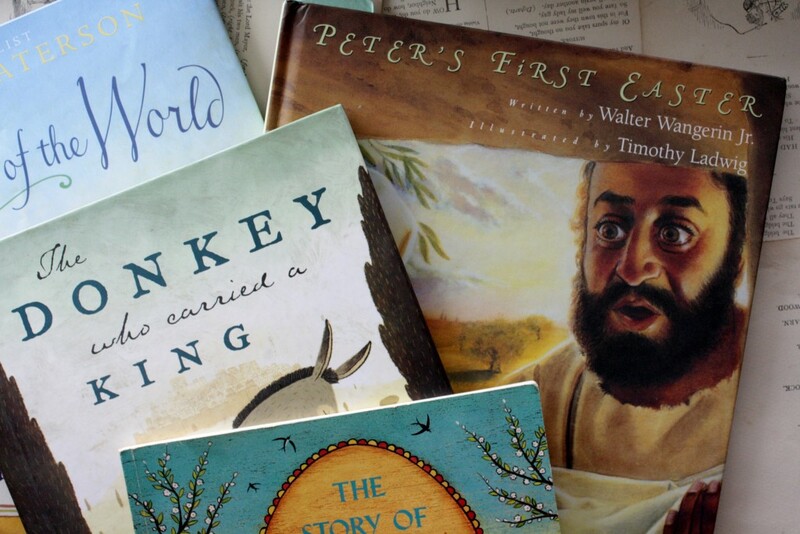 I need to know the Big Story of Scripture and how my kids (and I) fit into it. And I need to be fluent enough in it to remind them of it when called upon, in a heated moment, to do so. This is brought home to me again and again. I make no assumptions about you other than that you are, like me, in need of the gospel, and you clearly love good books (or you wouldn’t be here). So I offer for you the best book, in a format that makes that Big Story—the gospel—shine like a diamond just rubbed free of grit. 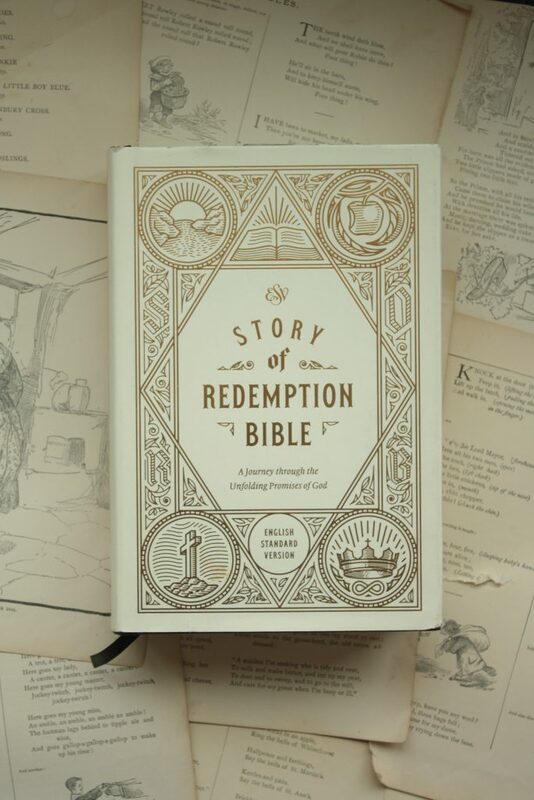 The Story of Redemption Bible is something between a study Bible and a reader’s Bible: it’s beautifully formatted in a single column so it reads like a thick, pretty book, but woven through it is commentary by Greg Gilbert. Every interjection is meant to point back to that single narrative that arcs through all 66 books of the Bible. See how this connects here? he asks, pointing from some obscure prophecy in Malachi to the moment Jesus fulfilled the prophecy in the Gospels. 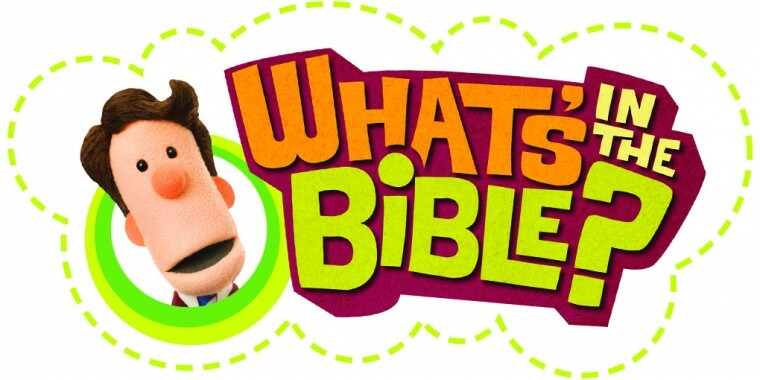 Making these connections always enlivens my understanding of Scripture. It helps to put those strange passages of Scripture in context. Understanding where the sacrifices began and why they were necessary makes Jesus’ coming—and his abolition of the sacrificial system—all the more beautiful. 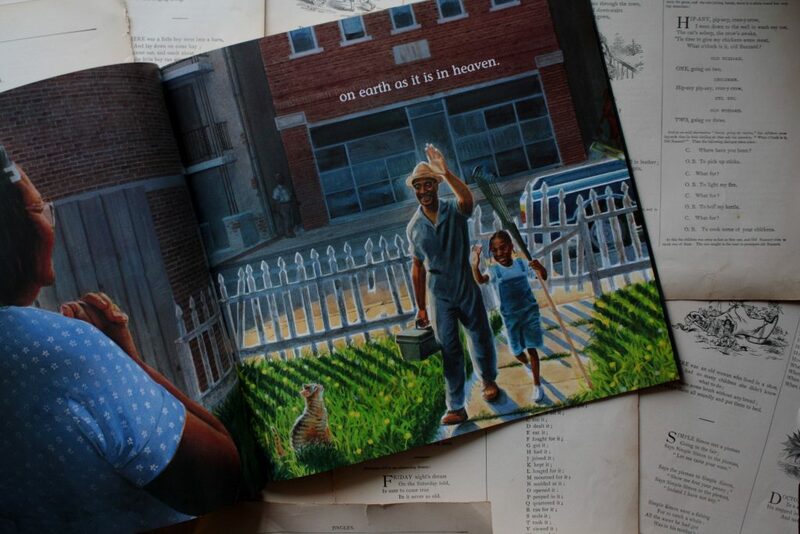 I love the Author of this story; I love that we are a part of it. 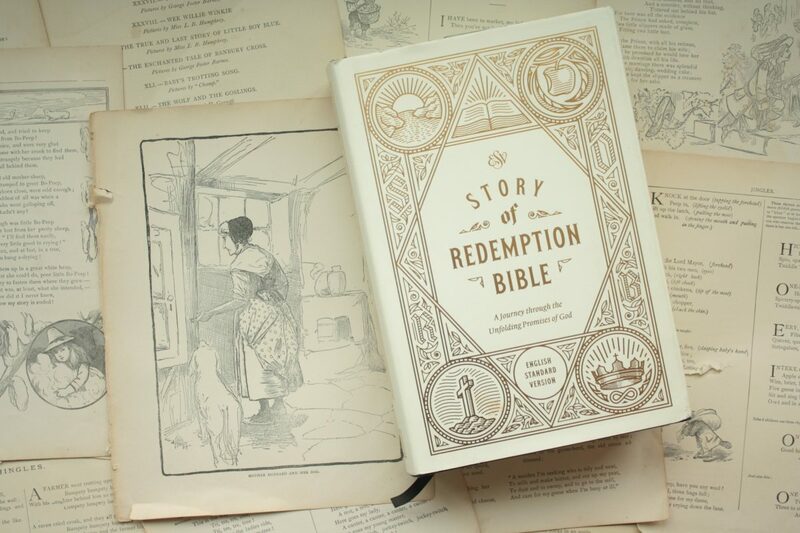 And the gorgeous design of The Story of Redemption Bible reminds me, when I read, that the Bible is no ordinary book. 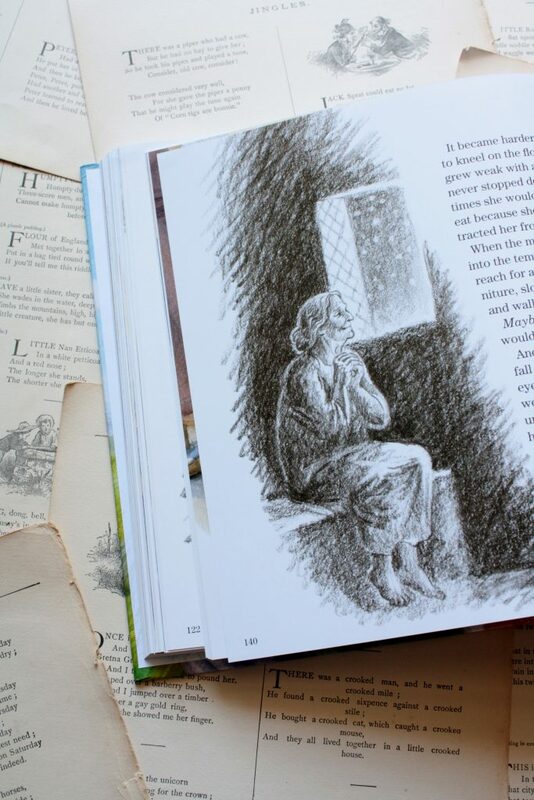 Peter Voth’s illustrations illuminate the text. 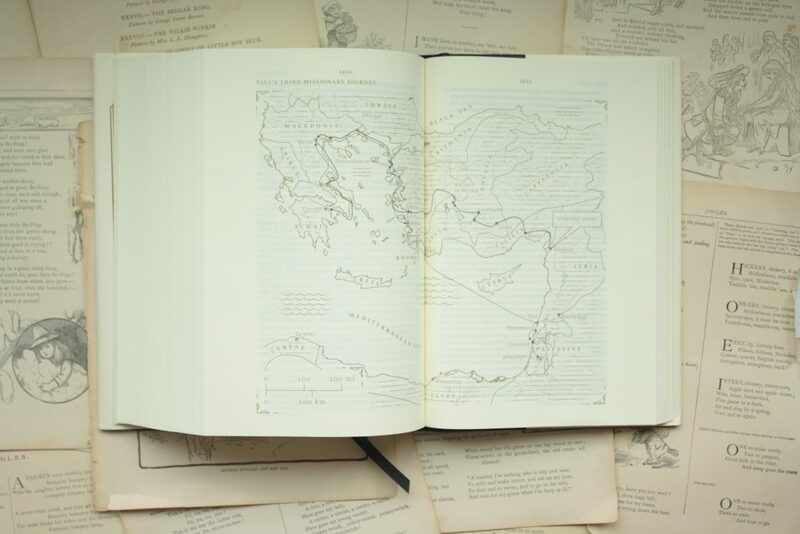 Elegant maps and timelines don’t gather idly in the back of the Bible, waiting for an invitation to dance, but stand proudly where they’re most needed: right where they’re mentioned in the text. 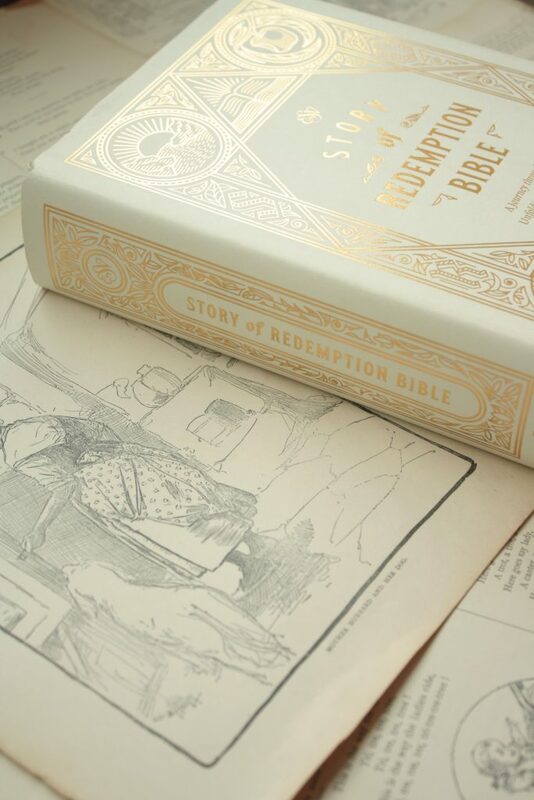 The Story of Redemption Bible also offers two reading plans: one that will take you through the whole Bible in a year, from cover to cover, and one that will take you through the Bible in chronological order, interweaving the prophets with the narrative books about their lives, or interspersing Paul’s letters throughout readings from Acts. 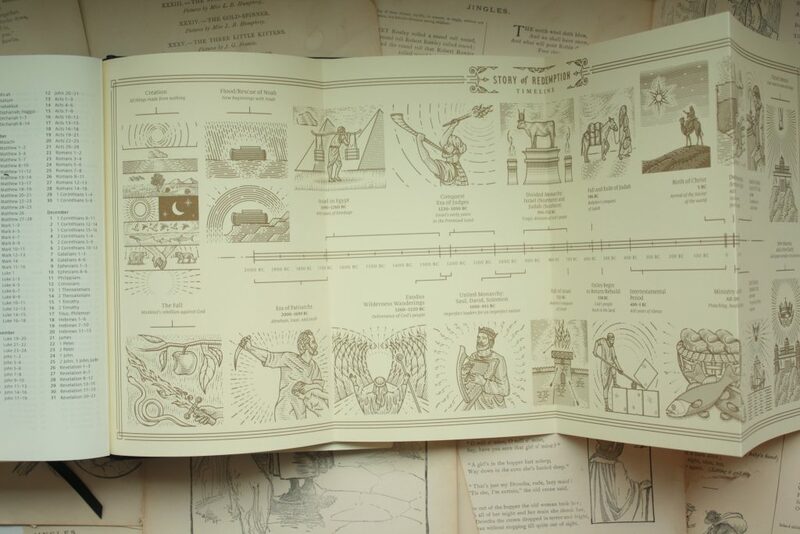 And a fold-out timeline of God’s redemptive story tucks into the back of the book, ready to be explored. So this one, dear parents, is for you. Let us love our God more every day and draw freely upon his wisdom and grace when we need it. Let us remember that we’re not yet at the end of his story, but that that ending, when it comes, will be glorious. 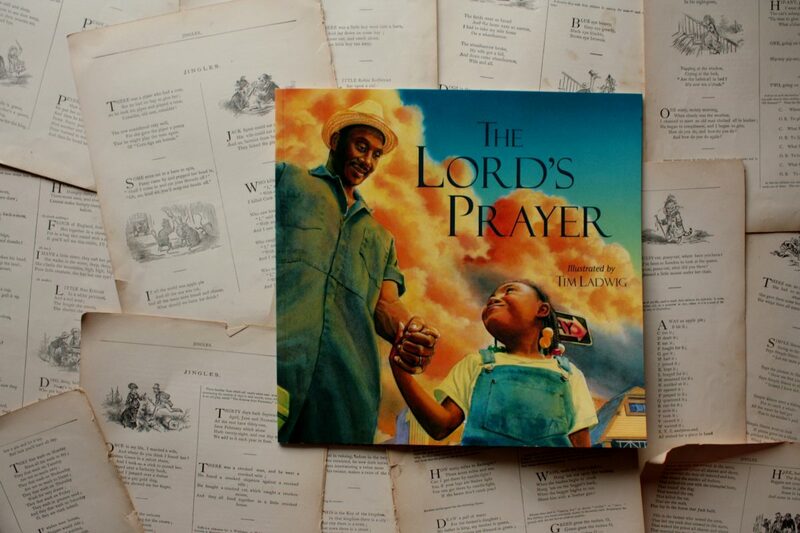 My newest piece, “In the Beginning,” went up on the Deeply Rooted blog this morning! 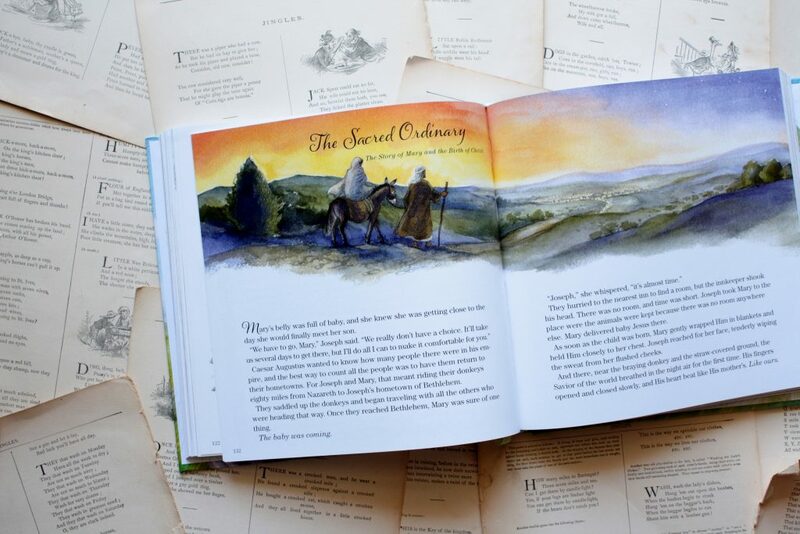 In it, I got to look at how the Christmas Story fits into God’s larger story of redemption. You can read the full post here. May you all have a Christmas that is restful in the deepest sense—a celebration centered on Christ, who tucked himself into a finite human body because he loves us. May that be your refrain as you travel, bake, and wipe noses: Because he loves us. Because he loves us. Because he loves us. 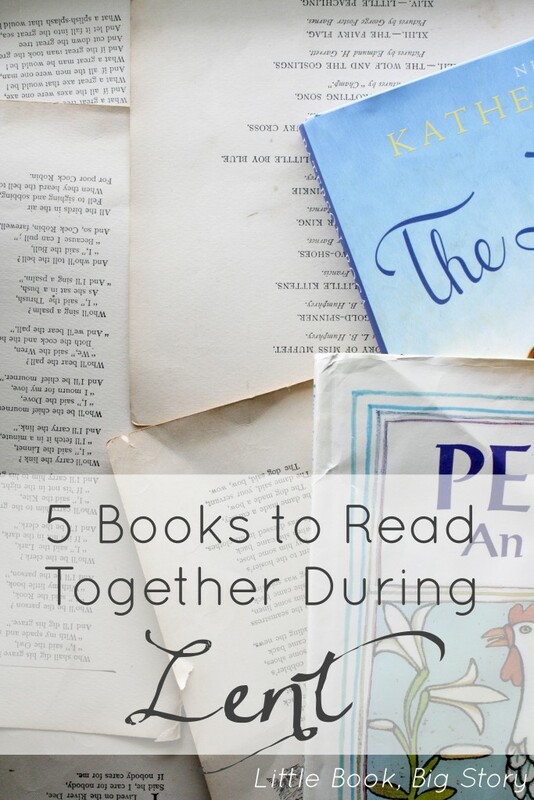 This post originally appeared on this blog in March of 2015. Our church celebrates Ash Wednesday with a simple liturgy read in a shadowy room. We light candles, draw the sanctuary’s chairs into a circle around our pastor, the table, and the ashes, and at the end of the service, file up to our pastor and wait for our turn with the ashes. As he draws a cross in black ash on each brow, the only sound is his voice saying, musically, “Dust you are, and to dust you shall return,” to each of us. Even the children—and a high percentage of our small church body is under the age of five—fall silent for this. Ash Wednesday leads us into Lent gently but decisively, just as Lent leads us toward Easter with the patience of a farmer sowing seeds. I love Ash Wednesday, though it tends to sneak up on me each year, coming as it does almost on the heels of Christmas. But this year, I got the jump on it: while planning posts for this blog, I saw it on the calendar and thought, “A ha! Not this year, my friend!” This year, I was ready for it. 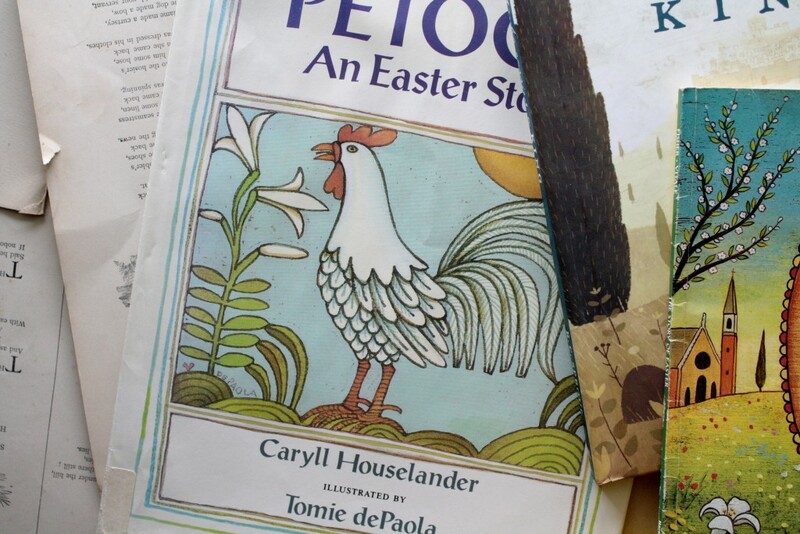 I dug out the Easter books and photographed them for you; I considered Lent with prayer for an entire week before Ash Wednesday. And I gave thought to how our family would celebrate, which led me to think about how you might like to celebrate with your family. 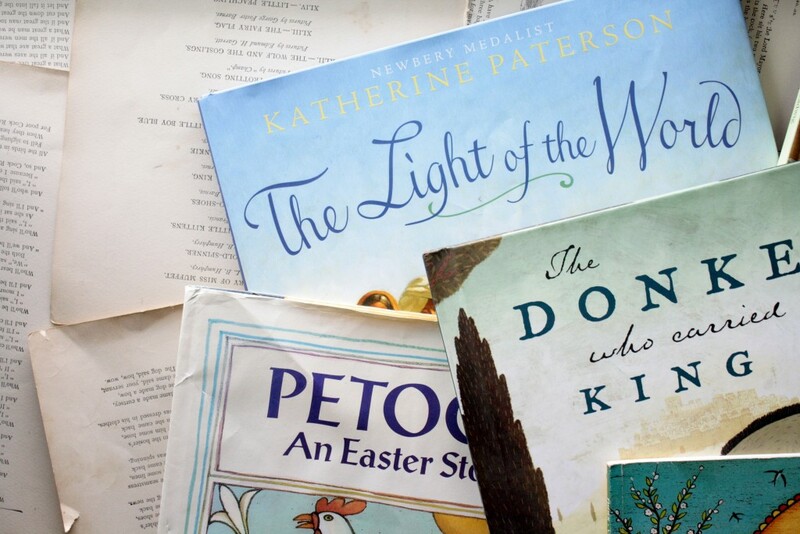 I suspect that, for both of us, a good celebration begins with good books, and with that in mind, I compiled a short list of books for Lent that our family has loved from year to year. 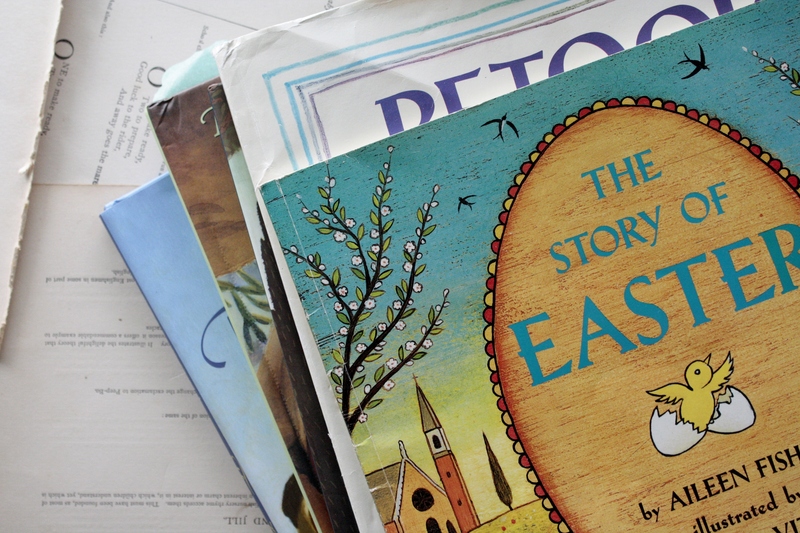 2 | Peter’s First Easter, by Walter Wangerin, Jr. 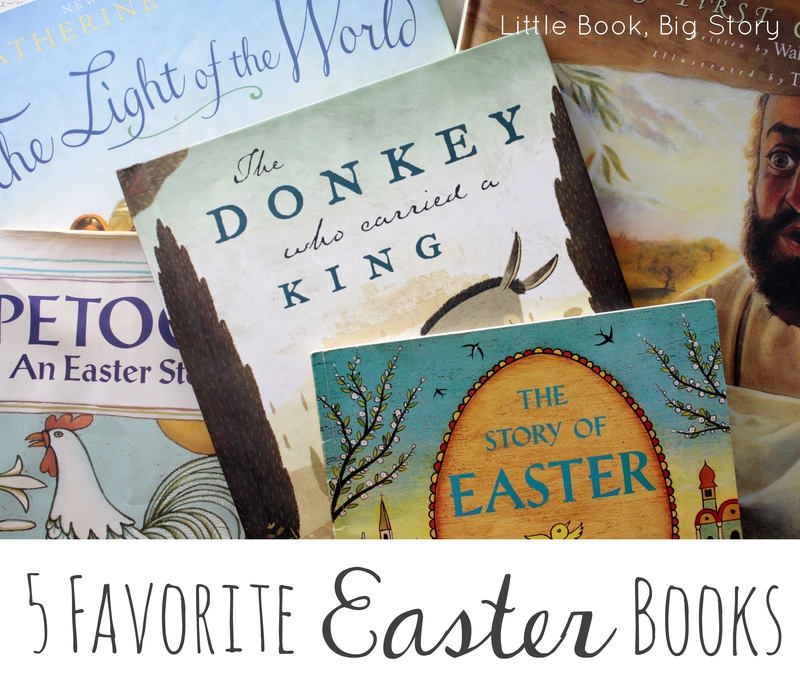 These are my top five Easter favorites, but they are not the only Easter books featured on Little Book, Big Story. 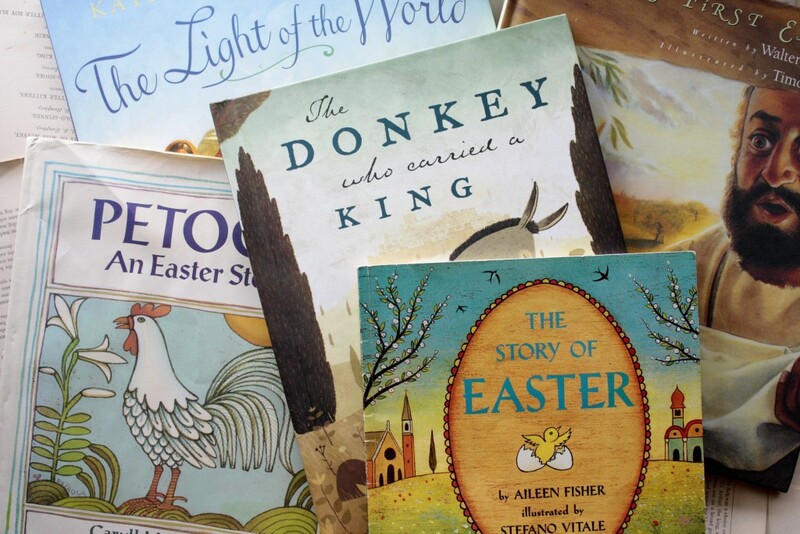 You can read the other reviews in the Easter section of the blog. I’ll share still more with you during the next few weeks, as a bookish way to observe Lent. Advent usually sneaks up on me, stealthy in its own way, but this year I got the jump on it. I have a writing deadline to thank for that. Some writers work well under pressure, but I don’t. I am a slow and steady sort of girl, a write and rewrite and rewrite and tinker and put it down for a few weeks and then come back and rewrite some more sort of girl. 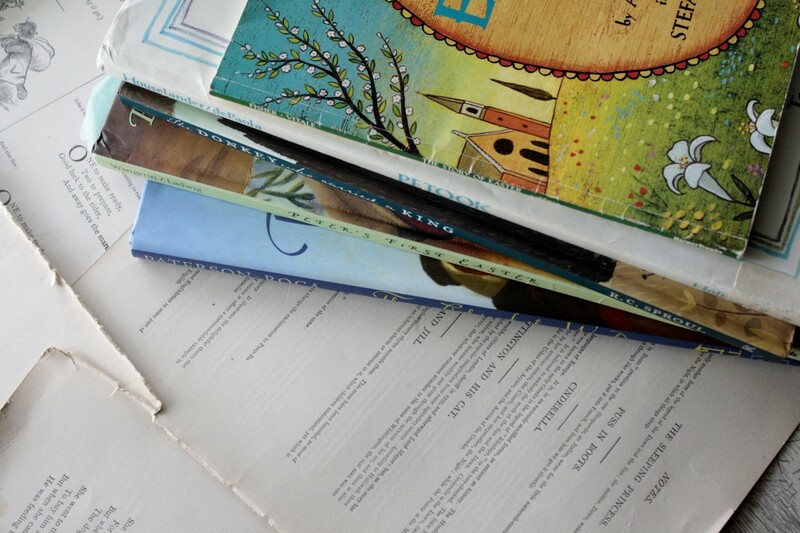 I am the sort of girl who can spend a year (yes, a year) on one article. I know that now. But Lindsay Cournia and I are taking turns looking into each of the candles on the Advent wreath as part of a series for the Deeply Rooted blog, and researching a post on the Old Testament prophecies of Christ, it turns out, is a lovely way to prepare for the season. The first post, “The Candle of Prophecy,” went up this week, with more to follow throughout Advent. 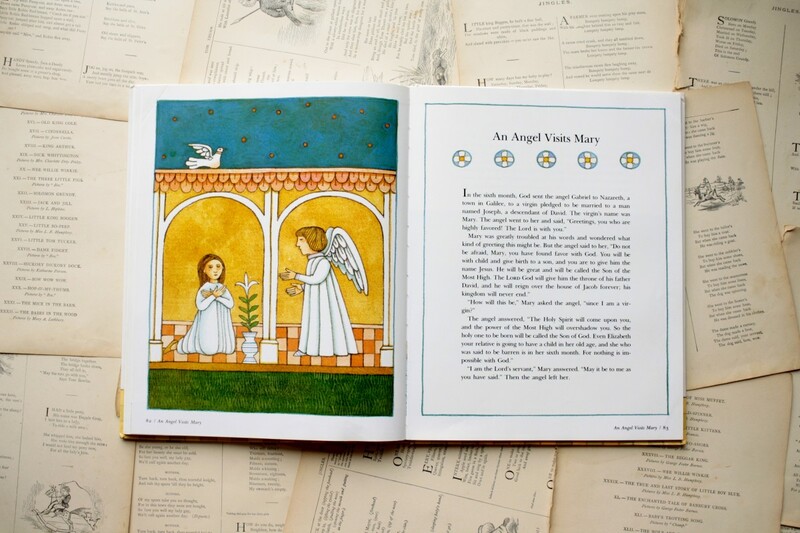 Jesus’ birth in the manger was not a sudden impulse of God’s. 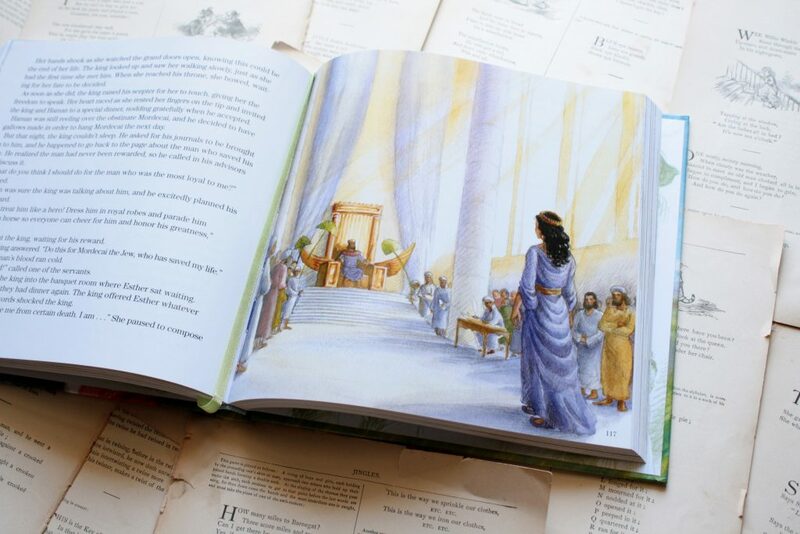 He did not decide, on a whim, to send his Son to earth, but laid the ground for his coming painstakingly, over the course of thousands of years. Like a skilled author, God foreshadowed Christ’s coming through promises, covenants, and prophets, so those with eyes to see might recognize, in that one small child, the beginning of the end of God’s enemy—the first stitches in the mending of our broken world. As we light the first candle of Advent, we look back at the long history between the Lord and his people, the Israelites, as he prepared them for the coming of his Son. . . . I hope you enjoy the series and that the posts feed you half as much good, Old Testament food as they did me as I prepared to write them. Also, the new issue of Deeply Rooted is on sale now! 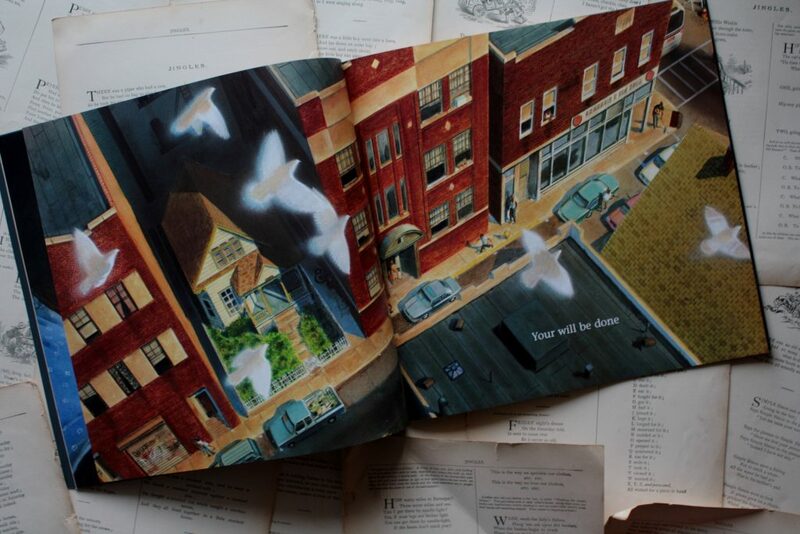 I had the immense pleasure of interviewing Plumb for this issue, as well as writing a giant article on parenting philosophies and Scripture (that’s the one that took a year to nail down). 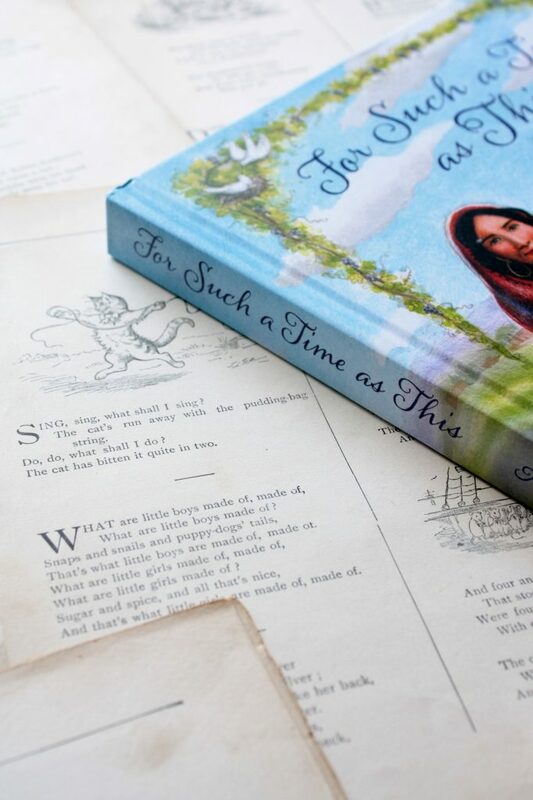 I don’t have my copy yet or I’d share photos, but I know that Jen Wilkin has a beautiful piece in it (but then, her writing just is beautiful), and that the issue is filled, as ever, with articles rich in theology and practical help. 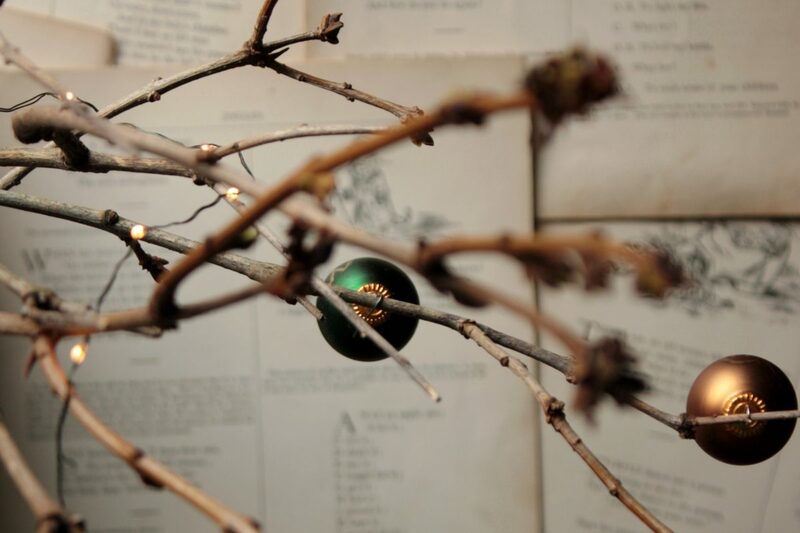 Also, copies of Deeply Rooted make great Christmas gifts . . .